Stumps left after removing dead or unwanted trees can prove to be an eye sore, lowering the appeal and value of your Lakewood property.Getting rid of these by stump grinding is essential to maintain the visual appeal of the premises and ensure your safety. While smaller stumps can be removed without much hassle, getting rid of bigger and heavier stumps requires expertise and special tools.At Hunter's Tree Service, we adopt a quick and easy way of stump grinding to complete the task as efficiently as possible. We offer stump removal and stump grinding services in Lakewood according to your convenience and budget. With right equipment and techniques, our tree removal services for stump grinding and complete stump removal can remove any unwanted tree stump. 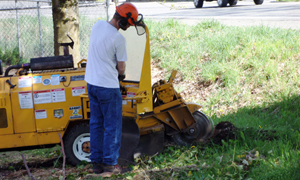 Hunter's Tree Service is renowned for providing services of stump removal and stump grinding to residential and commercial properties in Lakewood. Irrespective of the size or number of stumps to be removed, you can rest assured that the results will efficiently match and even exceed your expectations. 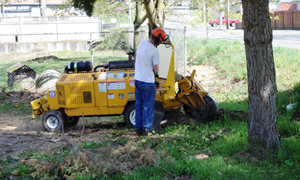 Our well trained and experienced workforce is fully aware of the complexities involved in the task of stump grinding. Safety is a crucial factor taken into consideration while carrying out any stump removal job, as not being careful can prove hazardous for the nearby properties and even the passersby. By analyzing the aspects, like location and size of stump, we are able to provide efficient results for the Lakewood homeowner. 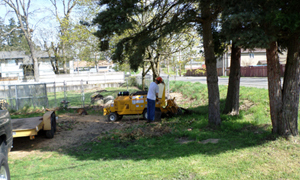 We use advanced machines which are capable of performing the task of stump removal efficiently and safely. Stump removal and stump grinding is definitely not an easy task and it becomes even more difficult when you lack proper knowledge or right tools. Still attempting to do it yourself can lead to unwanted hassles and even injuries. Hiring the professional tree removal services of Hunter’s Tree Service is the best choice for the Lakewood home or business owner.